Texas saw unprecedented growth in military training sites during the Great War. The climate and ready availability of open land made Texas an attractive location. In the case of early Army aviation training sites, Texas was the site of one third of new fields established in the U.S. during the war. As with many wars, politicians and entrepreneurs also saw the potential growth opportunity. Many cities lobbied for cantonments and expansion of existing military posts. Contracts to build base infrastructure and supply these facilities were lucrative. Documenting the many WWI Texas bases, cantonments, flying fields, depots, and outposts is no small matter. 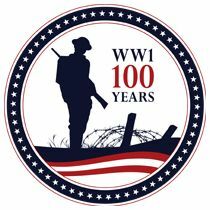 This is our best effort to compile a comprehensive list from numerous sources (bases used during WWI and the date they were established is noted). In February 1917, the facilities at the reservation were renamed Camp Funston in honor of Major General Frederick Funston. 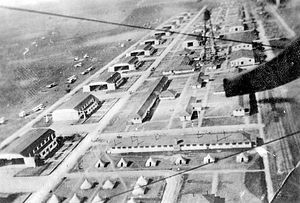 In preparation for World War I, Camp Funston established the First Officers Training Camp (FOTC) in May 1917. Drills and training at the FOTC included practice marches, target practice, and trench warfare training. Officers of the FOTC graduated in August 1917, after which a Second Series Officer Training Camp began. Ft. Clark (Brackettville) – 1852. Training station for field hospital and ambulance companies. Texas A&M campus (College Station). Specialized training for approximately 4,000 U.S. Army soldiers (motor mechanics, meteorology, etc.). Aviation General Supply Depot, Houston, Texas. Its activity consisted in storing obsolete materiel and providing additional storage space for planes, spares, and engines in excess of the storage facilities at nearby Ellington Field. Aviation General Supply Depot, Kelly Field, Texas. The depot operated as an equipment station, supplying in particular, Kelly Field, Brooks Field, Ellington Field and Gerstner Field. Aviation Repair Depot, Dallas, Texas. Activities consisted in repairing and overhauling airplanes and engines for Barron Field, Brooks Field, Call Field, Carruthers Field, Ellington Field, Gerstner Field, Kelly Field, Love Field, Post Field, Rich Field, and Hicks Field. Used Love Field for test flights of repaired machines. Nice piece of work. Thanks. Such a powerful-sounding work and how I would love to see it. North America has its own story regarding treatment of Sikhs – I think it was the ship called the Komagata Maru with Sikh families seeking to immigrate to Canada, as British citizens and veterans of WW II which anchored outside either Vancouver or Victoria and the families ultimately had to return to Calcutta. There also is a remarkable story about the Ghaddar Movement, involved with the Germans during WWI which started as a student movement at Stanford, culminating in arrests, a trial and a killing in the courtroom. Just great material. Thanks much Jann for reporting so vividly.